There’s only one thing more fun than funny dog and cat memes. Dog and cat pet Halloween costumes. Whether or not your pet normally wears clothes, Halloween is the perfect excuse to dress your dog or cat up. 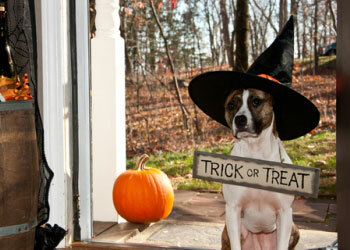 Around the country, many communities have special Halloween events just for your furry friends. In Boston, the 5th Annual Halloween Pet Parade and Costume Contest will be held on October 28, and awards include “Top 3 Best in Show,” “Best Owner & Pet Combo,” and “Most Creative.” Other events include the Spooky Pooch Parade in Chicago, and the Haute Dog Howl’oween Parade in Long Beach. with witches rounding out the list of top picks in 2017. For last minute costumes, try making your dog into a Lego block using painted cardboard and upside down Styrofoam cups, or a cowboy by loosely tying a bandanna around your dog’s neck. 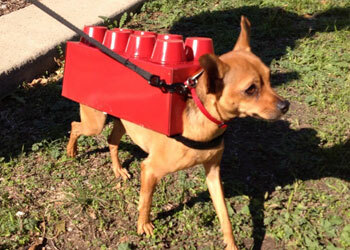 Some pet owners will select combo costumes for themselves and their pet, and some great costume ideas can be easily made at home. Popular dual costumes include Wayne and Garth; Dorothy and the lion from the Wizard of Oz; hot dog vender and wiener; and E.T. and Elliot. While dressing your dog or cat in a costume is a lot of fun, you should make sure that your dog is safe, and never force your dog to wear something that causes anxiety. While most pets enjoy attention, you should look for these signs of anxiety or discomfort: pacing, panting excessively, pawing or clawing at the costume, or sitting or lying down and refusing to move. Some pets enjoy wearing hats, and clothing, but make sure that your pet is still able to move freely and unimpaired. The costume should fit well, and remain in place, but should not be too tight, or too loose. Don’t cover your pet’s face or ears because that can be uncomfortable and won’t allow your pet to see or hear properly. Be sure to check for choking hazards, especially small pieces that could come loose, or be tempting for your pet to bite off and eat. Halloween is a great holiday that you can enjoy with your family and pets. Make sure to be safe, and don’t be offended if you dress up as a dog, and people can’t tell you apart from your pet. Happy Halloween!